Nearly 400 people, including university students, were taken to safety on Saturday by a team of defence and National Disaster Response Force personnel as operations continued in full swing to rescue and distribute relief to those stranded in the aftermath of the torrential rains in Chennai. 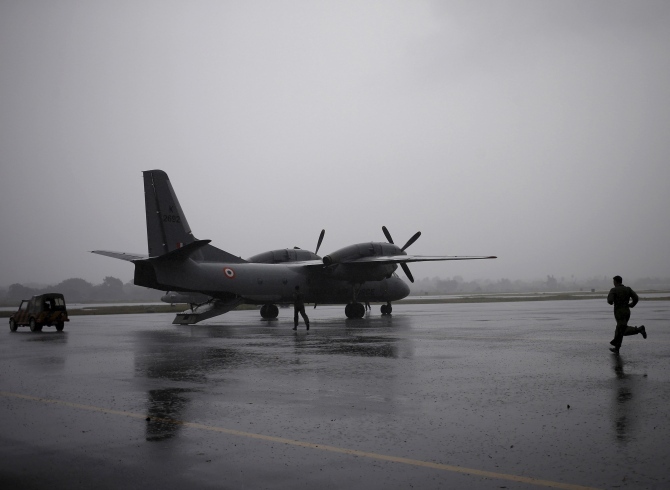 Defence aircraft as also a few civilian ones ferried people to Delhi and Hyderabad since morning even as the Indian air Force flew sorties to bring more people to the naval base that has played a critical role in the overall operations. "A C-17 Globemaster carrying 172 people left from here at around 11:30 am for Delhi. A TrueJet flight also took off carrying 70 people, who were flown to Hyderabad. "An IndiGo flight will soon fly to Delhi with 150 people on board," a senior naval official told PTI. 'INS Rajali', the naval base and the Tambaram Air Base, about 30km outside of Chennai, have been working in tandem over the past several days to bring people to safety. Over 600 people, including stranded civilians and defence personnel, were on Friday flown out from Chennai. "We sent about 300 people from the Tambaram Base to Arakonnam Base throughout the day. No more sorties are planned as yet," said Flight Lieutenant Mohanan Chandrika at Tamabaram Base. The navy official added that Mi-14 and AN-32 brought people in batches to the base as operations continued on Saturday morning. Meanwhile, as large areas of Chennai airport remained flooded, commercial operations continued to be suspended there although technical flights have commenced. The Arakonnam base, located 70km west of Chennai, is currently serving as the makeshift airport. Civilian aircraft started a few rescue flights from Friday and four sorties ferried about 320 people from here to different place. "A TrueJet flight and a SpiceJet flight took people to Hyderabad and Bangalore, respectively, yesterday morning and two flights of IndiGo ferried rescued persons to Delhi," the official said. Around 150 people, among them 130 rescued civilians and the rest from the defence forces, were flown out on an IndiGo flight yesterday afternoon from the base. The other IndiGo flight, carrying 180 people, had left at night. "A C-17 Globemaster carrying 196 people was also later flown in on Friday as chopper sorties brought in more people later in the day, including 70 students from the Chennai-based SRMUniversity who had been flown into Tamabaram Air Base earlier. "Another C-17 carrying just seven people was also sent to Patna," a senior naval officer said, adding that the navy's Chetak helicopters, too, have flown sorties to bring rescued people to safety.